1. I’ve previously installed ADE on my windows 7 laptop, but wasn’t using it (or may i say know how to use it properly, more info below). 2. Browse to my library’s digital collection (which uses overdrive) and borrowed a few ebooks, downloaded them as epub and was able to open and read them using ADE. 3. Downloaded the overdrive mobile app, registered for an overdrive account id, signed in, browse to my bookshelves and found nothing in there. To think that books that have been borrowed and downloaded into ADE will magically appear in the overdrive mobile app bookshelves. That won’t happen if you’re using windows 7 and ADE. I read that windows 8 can do it but haven’t tried that yet. If that menu is disabled, it means you haven’t authorize before. Long story short, books that i’ve previously downloaded and opened in ADE were tied to my adobe id, so when i tried to download them using my “overdrive id” in the mobile app, it failed. So if the id the book is “licensed to” isn’t the one that you’re using to login into overdrive, you have a problem as mentioned above. 2. If you haven’t already, register for an overdrive account login. Go to ADE > Help > Authorize Computer and fill in blanks and make sure you select “overdrive” as the content provider. 2. Check ADE > Help > Authorization Information and make sure that the overdrive id is being used as the default id. If not, click on the “Change Default ID” button and do so. 3. 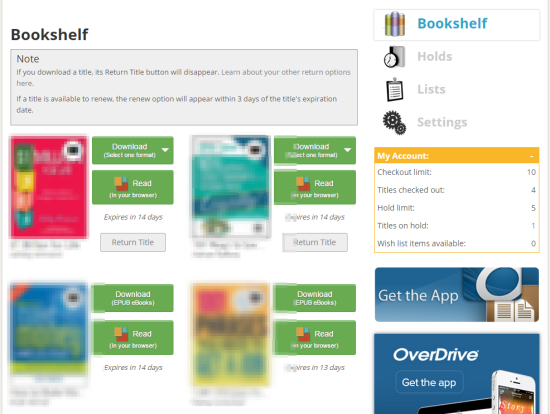 Search, borrow and download the same book again in you library’s overdrive. 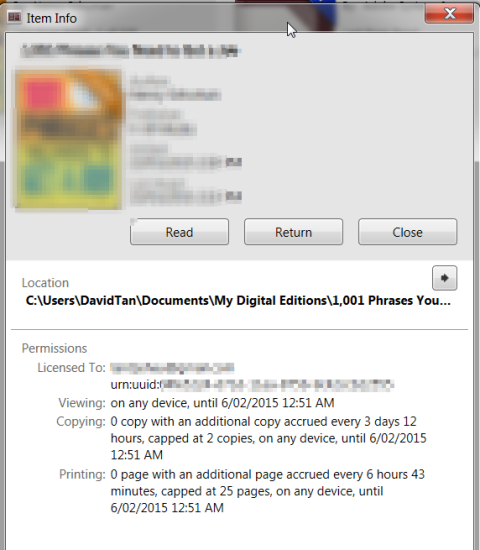 Open the downloaded *.acsm file in ADE and check the item info to make sure that it’s tied to your overdrive id. 4. Now finally, in your overdrive mobile app, login using your overdrive id, login to your library, go to your library account bookshelves and download those books again. This time you won’t get the dreaded “ebook has been checked-out by a different id” message anymore. Use overdrive id for authorization in ADE, and remember to login using the same overdrive id when using the mobile app. 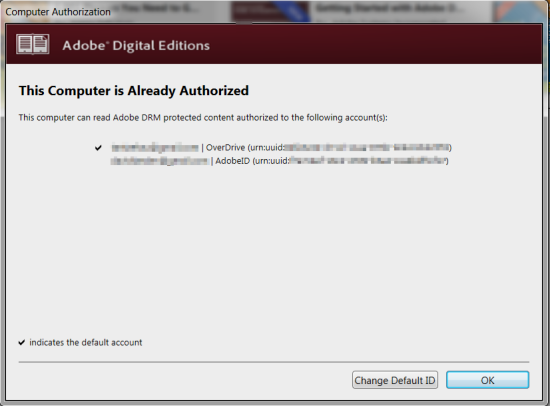 Technically, you won’t even need an “adobe id” (which I’ve seen caused lots of confusion with other users).